Its the spookiest time of year to visit a Disney Park and if you are planning an October visit, you might have one specific item in mind to snag as a worthy memento of your trip. The one, the only, Poison Apple Stein. This mug blew up on the internet last year, mostly on Tumblr and Pinterest. You can’t carry it around in the park for more than 5 minutes without someone stopping you to ask “where did you get that mug?! ?” and proceeding to head in the direction you pointed them in. So the question I an many others have been asked so many times this month is where do you get it? Well I have created a comprehensive list for you guys AND a video, with that answer in mind. 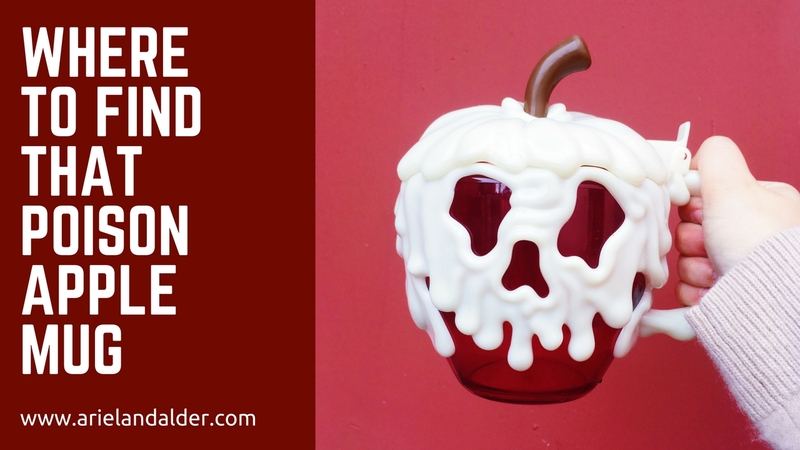 Here is how you can find THE poison apple mug on both coasts. Something to note is that the mug is priced differently depending on where you buy it. Sometimes the mug is filled with fruit, ice cream sundaes, frozen lemonade, and if you ask you can just buy the mug plain and keep it clean to take home. I have tried to list the various prices where I can but if you know of a change or correction, make sure to comment and I will update the listing. inside fantasy faire, across from the theatre. Get the mug filled with a frozen beverage for $12.99. They also offer the mini poison apple glow cubes for $4.00 with any drink. Across from the ride, next to the mark twain. Get the mug filled with fresh fruit for $10.99. Across from the ride, get it filled with a frozen beverage for $13.50 or get it clean and empty for the same price. In the front of Buena Vista Street, right where Oswald does his meet and greet. Get the mug filled with fresh fruit. in hollywood land next to the smoothie place, look for the building with the mosaic wall. Get the mug filled with fresh fruit for $10.99. right next to Starbucks on Buena Vista street. Sometimes I have seen the mug offered with a sundae inside. A note about Magic Kingdom mug access: As far as I know, the poison apple mug is only available during Mickeys Not So Scary Halloween Party. If someone has insight on this, please comment below! Right across (sort of askew) from where Jack and Sally meet in Liberty Square. Fill the mug with an apple pie sundae complete with caramel sauce. right next to the teacups! next to the “Winnie The Pooh” ride, get the mug filled with frozen lemonade and gummy worms. We got our mugs at this location during Mickeys Not So Scary Halloween Party. As a last and final resort, you can always order one on Ebay. But it will run you double the cost of a mug at the park. Ive also linked a few poison apple items to browse in the widget below. Separator image Posted in Disney, Holidays, Travel.